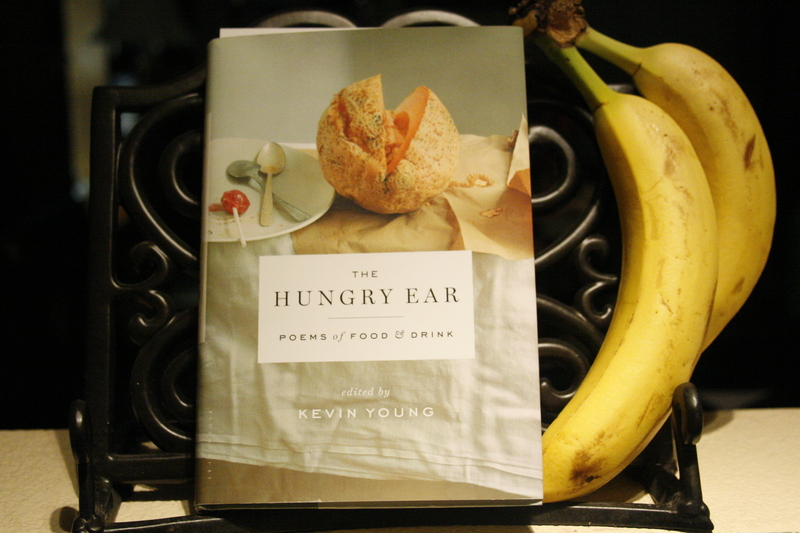 “The Hungry Ear,” Poems of Food & Drink was my most recent book purchase. It’s probably my favorite book purchase ever. Last week my partner and I had discovered a new used bookstore locally, and found ourselves in a toyland. We’re obsessed with anything that has pages sandwiched between two decorative flaps. It’s the same every time: My partner immediately finds himself tugged toward the art or graphic novel section, and I toward the self-help, crafts or health areas. We’re pretty predictable, especially when we drop by the same Barnes & Noble each week. We know the layout of our world, and the countries (topics) to which we like to travel to, and wander off to our preferred fairylands to escape for a little while. But expanding our horizon for the first time in a few months made us realize how sheltered we’d been, going to the same Barnes & Noble every few weeks, and just how limited their selection was (and how slowly they actually move their merchandise). We weren’t sure where to start! And everything sounded interesting. For the first time in almost a year, I found stacks of books I wanted to bring home. I picked up sundry books and then put them down again that afternoon, trying to decide. My interests vary incredibly, and so did this store’s book collection. It was a match made in heaven. I approached some fiction, but I was drawn predominantly to reference, as usual. Crochet. Photography. Women in farming (yes, I even considered picking up that one). But I then discovered the back of the store. I wandered over to a three-step staircase that led to a small dais area. It was a much larger poetry section than I’d seen in a long time. And, believe it or not, since I have on my vision board to “read more poetry,” I approached with intention rather than simply browsing. A cursory glance through the rows of bindings like multicolored piano keys brought this title to my attention: “The Hungry Ear,” Poems of Food & Drink. And then I imagined it with this one lone book of poetry about food. I giggled with contentment. It was the perfect way to marry both of my worlds, past and future. Reading other people’s passions about food made me want to start writing poetry again. And to re-experience cooking and eating from a different place. To analyze food sensations, and see what connections I make. Scientifically, they say that taste and smell are what we most associate with memories of places, people, moments in time. It’s not surprising, then, that so many people write about life in relation to food. It’s related to culture, family events, pleasure, and love. For me, food and expressing love for friends and family is nearly indistinguishable, as I had once blogged. There may be plenty of muses and inspirational topics out there for art; but besides love and family, it seems like food tops the lot. So, keep inspired everyone! And may your food taste like good poetry. Next postBacteria & Food: Is 5-second rule mankind’s undoing?